Rawalpindi (Monday, April 16, 2018):- The directorate of National savings of Pakistan will held Rs. 750 Prize bond 74th Draw in Common Serial dated 16th of April 2018 and it will be organized in office of the Qaumi Bachat Bank(National savings of Pakistan) Rawalpindi. You may check online Prize bond 750 2018 April list result Rawalpindi on bondresult on 16/04/2018 seeked from savings.gov.pk at 9:00am. The first & second prizes winning numbers will be announced at this time in public access and the full draw of the Rs. 750 Prize bond Rawalpindi 2018 at the sun down time in evening when the balloting will be stepped in searchable internet format for the Public. Bondresult will share the full draw of 750 Prize bond 16 April 2018 Rawalpindi on this page at 5:00 pm with the full prize category with searchable view for you. You may see we are committed to share the all latest prize bond draw result list schedule and all other information relating to savings schemes in Pakistan. So help us by visiting and feedback on each draw when we share in positive way. Like the other savings denotations this smart amount but tricky scheme papers is famous among the public from many decades, as this have low value to buy and have good amount of money prizes for all of you. 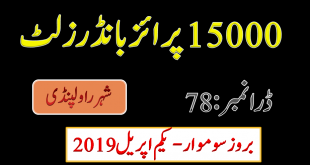 The prize bond draw result complete list 750 2018 April in Rawalpindi city can be seen a good chance for the buyers that have search the favorite horoscope for them that what will be the fixed number for this draw. In my view we must buy the bundles if we can avail as this may increase the chances of winning state bank of Pakistan prize bond list 750 draws in good way and we may win handsome money in each month. A mostly a bundle of Hundred bond may get two or more prizes each year in different draws. 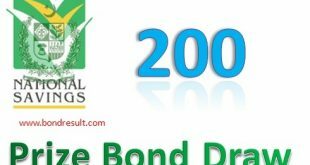 If we have a list of 750 Prize bonds then we may found many mobile app and different website that may get search your full draw in real time with 100% accurate results. I mean if you have a Prize Bond List 750 2018 copy and you want to search it for the month of April Rawalpindi On 16-04-2018 the you have to simply select you denomination and get dive into search results. That will give you a comprehensive detail of the draw date, prize amount and held city in a row. You may be lucky in the draw for the previous six year. If you have a bond and you’re the draw date have not passed more than six year then you have the chance to withdraw that prize from the state bank of Pakistan by simply filling a form. In simple words you may cash your prize in six years from the date of prize announced. The Rs. 750 Prize Bond Draw in Rawalpindi on 16th April 2018 organized by National savings of Pakistan have many winning chance for all of us. We should buy more and more papers to get high chances of winning. The new Draw # 74 of Rs. 750 Prize bond list will be held in Rawalpindi city on 16 April 2018 full draw will be shared on this page. So you must get in touch with us to get the latest national saving prize bond draw rs 750 16 April 2018 on this page soon.